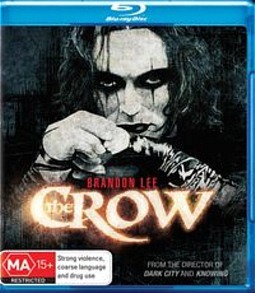 One of my favourite movies of my early 20's, I was super excited when asked to review this edition of The Crow on Bluray. Immediately upon putting the disc into the player we are subjected to the Roadshow logo, then it immediately goes to a very sparse menu with black background and a flaming crow atop it. Looks sweet. For those of you who don't know, The Crow is romantic tragedy that deals with rock star Eric Draven and his fiance Shelley who are murdered on the day before their wedding. The story goes that such love cannot go unavenged, and Eric is brought back from the grave a year later by a mysterious crow, to take the lives of those who destroyed his. This is a gritty film directed by Alex Proyas and starring the late Brandon Lee, who died during the production of the film. This was, and is a brilliant movie, the likes of which really have not been reproduced since. Based on a comic series by the same name, The Crow quite rightfully gathered a cult following that still remains to this day. The movie also spawned a couple of sequels, some good, some not so good. Audio is letdown on this release with what could have been a spectacular remastering simply not attended to. The sound on this feature rarely hit the rear speakers, in fact I am not even confident that it did at all other than when the movie's menu played. Volumes were low in most cases and explosions lacked the punch that they could have contained. It simply did no justice to the movie at all. Extras on this disc include profiles, behind the scenes features, extended sequences and making of. There is also a profile on the creator of The Crow James O'Barr. The Crow is one of those movies that I do think that everyone should watch at least once. It is a great story of revenge and redemption that should appeal to all viewers. It looks amazing from a visual viewpoint and would still stand tall as one of director Proyas' finest achievements.